Ready to see what was in the September 2016 box? Remember, this month was all about combinations. So this means we’ll be looking for at least 2 inclusions in each bar…which means this was a pretty interesting month! How did you enjoy it? Don’t forget to let us know! 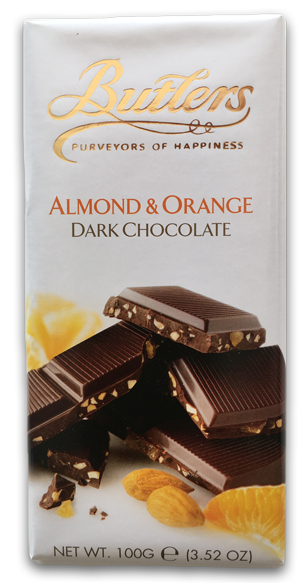 We’ve included a bunch of milk chocolate bars from this maker in previous boxes, but this is the first dark chocolate bar of theirs that we’ve included. Now, about the flavors (yes, flavors plural…remember each of these bars has at least TWO inclusions!). This bar included a pair of flavors that usually isn’t combined…not in chocolate at least. But once we tasted it, we wondered why people don’t combine these flavors more often! It’s really a fantastic combination. We’ve included their honeycomb crisp and butterscotch bars (all milk chocolate) before, so if the wrapper looks a bit familiar, that’s why. And, we’ve loved all of them. Now, on to the inclusions… the main focal point of your efforts, of course, since guessing them is the name of the game! There are two inclusions (just like Bar A), but one ingredient is very similar between the two bars (nope, it’s not exactly the same) and the other ingredient is VERY different. First things first…Yes, that’s really the name of their company. 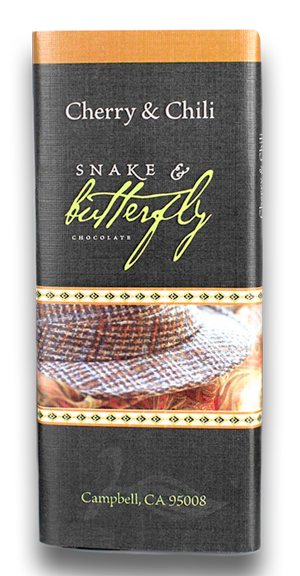 Snake & Butterfly — pretty awesome right? We sure think so. Anyway, back to the inclusions that we were talking about. Comparing it to Bar A, the cherry is fairly similar to the orange — both fruity, sweet flavors. Totally different story. You probably noticed it about 8.5 seconds after biting into your first piece. And then the bar finishes off with a slow burn. Now, none of this is to complain. Both of these are amazingly delicious chocolate bars that start off in similar fashions…and then get very different. Alright, now we’re on to the last bar of the box. Now this one IS an example of a bar that has a bit of an identity crisis. * Ok, ok, we’re not really taking bets. Gotcha! Anyway, back to the bar itself. The oddities are actually just getting started with the “dark milk” classification. Right. Tahini & roasted sesame. Shall we say more? Considering the fact that 93.76% of Americans don’t know what Tahini is (real fact, we promise**), we did the courtesy of Googling it for you. It’s a condiment made from sesame seeds used mainly in the Mediterranean and Middle East. So there. Our sophisticated, educated response to that? Go grab a chocolate bar, take a bite, and see how much better you feel. Alright ladies and gentlemen, that’s that! Your ride aboard the Mystery Chocolate Box, September 2016 edition is over. Please exit using the door at the rear, and make sure to exercise caution when stepping down. Handrails are your friend. Oh, and don’t forget to collect your bags from the storage section. Any unclaimed baggage will be examined for chocolate bars and promptly discarded (not the chocolate bars, of course, only the baggage that contained the chocolate bars. Naturally!). Lastly…what did YOU think of this box? And who can’t wait for the next one?? No Replies to "September 2016"